We've seen plenty of clever and quirky artwork centered on Disney's stable of princesses, but what about their other halves? 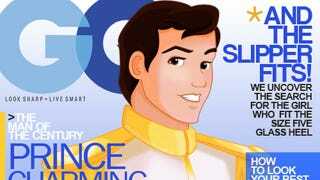 The Disney princes finally get their due, taking center stage on the covers of familiar magazines. Artist Petite Tiaras created these clever Photoshopped covers, and she did a similar (albeit rougher) series with the Disney princesses on the covers of women's magazines. It's interesting to compare the two. Most of the taglines on the princess covers are about beauty and love (except with Tiana, who gets mostly cooking taglines). The men do get some body building and romance, too, but these taglines suggest there is far more variety in their stories, even if most of them get less screen time than their gown-wearing counterparts.